Asian Americans, as a whole, are more politically liberal than the general public and tilt more toward the Democratic Party than toward the Republican Party. But Asians who are evangelical Protestants tend to favor the GOP, and they are more likely than other Asian-American religious groups overall to say they are politically conservative. Asian Americans’ attitudes on social issues such as abortion and homosexuality vary by religious group according to the same basic pattern as in the general public. But this is not true when it comes to opinions about the size of government. On this question, Asian-American Protestants, Catholics and the unaffiliated are more likely than their counterparts in the general public to prefer a bigger government offering more services rather than a smaller government providing fewer services. Half of Asian-American Protestants (52%) prefer a bigger government, compared with about a third of all U.S. Protestants (37%). The difference is starker among evangelicals: Half of U.S. Asian evangelical Protestants prefer a bigger government (51%), significantly more than the 20% of white evangelicals in the general public who say the same. About half of Asian-American registered voters are Democrats or lean toward the Democratic Party (52%), while 32% identify with or lean toward the GOP. Among all registered voters, 49% fall in the Democratic camp and 45% are Republican. Compared with the general public, however, more Asian-American voters across all religious groups say they do not lean toward either party. Political divisions among Asian-American religious groups mostly mirror those in the general public. U.S. Asian Protestant voters tend to identify with or lean toward the GOP (47%) more than the Democratic Party (36%), as do Protestants in the general public (51% vs. 43%). Republicans fare even better among Asian-American evangelical registered voters; more than half are Republican or lean toward the Republican Party (56%). However, support for the GOP among Asian-American evangelicals is lower than among white evangelical voters in the general public (70%). Mainline Protestant Asian Americans tend to diverge from white mainline Protestant voters on party identification. Among U.S. Asian mainline Protestants, 44% say they are Democrats or lean Democratic, while 37% are Republicans or lean Republican. Among white mainline Protestants, 44% also say they are Democrats or lean Democratic, but almost half (49%) are Republicans or lean Republican. U.S. Asians who are religiously unaffiliated lean strongly toward the Democratic Party, as do the unaffiliated in the general public. Among unaffiliated Asian Americans who are registered to vote, 63% say they are Democrats or lean Democratic and 21% are Republican or lean Republican. Similarly, 62% of unaffiliated voters in the general public identify with or lean toward the Democratic Party, while 31% identify with or lean toward the GOP. Asian-American Buddhists and Hindus are also more likely to be Democrats than Republicans. Indeed, among U.S. Asian Hindus who are registered to vote, nearly three-quarters say they are Democrats or lean Democratic (72%), while 9% are Republicans or lean Republican. Asian-American Buddhist voters also tilt strongly toward the Democrats over the Republicans, but not by as large a margin (56% to 27%). Catholic Asian-American voters are divided in their partisanship, with 42% saying they are Republicans or lean Republican and 41% identifying as Democrats or leaning Democratic. Catholic voters in the general public are also split (48% Republican/lean Republican vs. 44% Democrat/lean Democrat). In keeping with their partisan leanings, Asian Americans tend to be more liberal than conservative in their ideological views: 31% describe their political views as liberal, while 24% say they are conservative, and 37% say they are moderate. The opposite pattern occurs among the general public: a third of all U.S. adults (34%) say they are conservative, 24% say they are liberal, and 37% say they are moderate. Asian-American Buddhists, Hindus and those who are not affiliated with any religion are more likely than Asian-American Protestants or Catholics to describe their political views as liberal. Among Asian-American Buddhists, 34% are liberal, 19% are conservative and 36% are moderate. Among Asian-American Hindus, 34% are liberal, 14% are conservative and 44% are moderate. Religiously unaffiliated U.S. Asians are the group most likely to say they are liberal (42%, with 15% saying they are conservative and 36% identifying their views as moderate). The Asian-American unaffiliated are similar to the unaffiliated in the general public on ideology; 36% of the unaffiliated in the general public are liberal, 21% are conservative and 36% are moderate. As in the general public, U.S. Asian Protestants are more conservative than liberal. Nearly four-in-ten Asian-American Protestants (38%) say they are conservative, 19% are liberal, and 35% are moderate. U.S. Asians who are evangelical Protestant are especially likely to be conservative, while mainline Protestants are not. Among Asian-American evangelical Protestants, 45% are conservative, 16% are liberal, and 32% are moderate. However, evangelical Asian Americans are not as conservative as white evangelical Protestants (61%). Among Asian-American mainline Protestants, roughly equal shares are conservative (28%) and liberal (23%). Among white mainline Protestants in the general public, 32% are conservative, 23% are liberal. Asian-American Catholics hold ideological views that closely mirror those of Catholics in the general public. Both groups of Catholics are somewhat more likely to say they are conservative than liberal. In keeping with party affiliation and ideology, Asian Americans tend to prefer a bigger government that provides more services (55%) to a smaller government that provides fewer services (36%). In the general public, 41% of adults prefer a bigger government providing more services, while a 48% plurality prefers a smaller government providing fewer services. Asian-American Protestants tend to diverge from Protestants in the general public on this measure, however. About half of Asian-American Protestants (52%) prefer a bigger, more activist government, compared with 37% among Protestants in the general public. Asian Americans who are evangelical Protestant also tend to prefer a larger government (51%) to a smaller one (41%). This diverges sharply from white evangelical Protestants in the general public; among this group, 20% prefer a bigger government, while 71% prefer a smaller one. Asian-American Catholics are more likely than Catholics in the general public to prefer a bigger government, although the overall Catholic number masks large differences between Latino and non-Latino Catholics on this question. Among Asian-American Catholics, six-in-ten prefer a bigger government (60%), and a third prefer a smaller government (33%). Catholics in the general public are closely divided on this measure, with 45% preferring a bigger government and 48% preferring a smaller one. Latino Catholics, however, are even more likely than Asian-American Catholics to prefer a larger government (72% vs. 60%). Asian-American Buddhists (62%) and those with no religious affiliation (54%) are also more likely to prefer a bigger government to a smaller government. Despite their strong Democratic leanings, however, Asian-American Hindus are divided in their opinions about the role of government, with 46% saying they prefer a bigger government with more services and 41% saying they prefer a smaller government providing fewer services. In keeping with the Democratic leanings of Asian Americans, those who report voting in the 2008 election were more likely to pick the Democratic candidate. The survey finds that 63% of Asian Americans who turned out to vote say they voted for Barack Obama, while 26% say they voted for GOP nominee John McCain. This finding closely mirrors those from the national exit poll on the Asian-American vote.42 In the general public, a 2011 Pew Research Center survey found that 54% of those turning out say they voted for Obama, while 35% say they voted for McCain. In general, Asian Americans from each religious group voted along the same lines as their respective counterparts in the general public. Among U.S. Asian Protestants who turned out, 47% report voting for Obama; this compares with 49% among Protestants in the general public. U.S. Asians who are evangelical Protestant are somewhat more likely to report voting for McCain; 45% of those turning out say they voted for McCain, while 35% say they voted for Obama. White evangelical Protestants in the general public are also more likely to report voting for McCain over Obama, but by a much larger margin (61% for McCain and 28% for Obama). By contrast, Asian-American mainline Protestants who turned out to vote report voting for Obama over McCain by a roughly two-to-one margin (60% to 32%). About half of white mainline Protestants in the general public say they voted for Obama (48%), with 41% saying they voted for McCain. Asian-American Catholic voters report voting for Obama (53%) over McCain (37%). This vote choice is similar to that found among Catholics in the general public (51% for Obama, 37% for McCain). U.S. Asians who are unaffiliated with any religion report voting for Obama over McCain by a large margin (72% to 18%). The same is true among religiously unaffiliated voters in the general public (70% to 20%). Asian-American Buddhists and Hindus also report voting for Obama over McCain by large margins. Fully 85% of Asian-American Hindus and two-thirds of Asian-American Buddhists (66%) report voting for Obama. Asian Americans’ views about homosexuality are similar to the views of the general public. Overall, 53% of Asian Americans say homosexuality should be accepted by society and 35% say it should be discouraged (compared with 58% of the general public that says it should be accepted and 33% that say it should be discouraged). Acceptance of homosexuality is closely tied to religious affiliation. Asian Americans who are not affiliated with any religion are among the most accepting. Fully 69% of unaffiliated Asian Americans say homosexuality should be accepted. The unaffiliated in the general public are also strongly accepting of homosexuality (79% say it should be accepted vs. 15% who say it should be discouraged). At the opposite end of the spectrum are evangelical Protestants. About two-thirds of Asian-American evangelicals (65%) say homosexuality should be discouraged. Views among white evangelical Protestants in the general public are similar (63% say homosexuality should be discouraged). U.S. Asians who are mainline Protestant tend to be more accepting of homosexuality than Asian-American evangelicals. About half of this group (49%) says homosexuality should be accepted, while 39% say it should be discouraged. A majority of white mainline Protestants in the general public are accepting of homosexuality (65%). Among Asian-American Catholics, the balance of opinion is toward acceptance: 58% say homosexuality should be accepted and 30% say it should be discouraged. Catholics in the general public hold similar views. Among Asian Americans who are Buddhist or Hindu, narrow majorities (54%) say homosexuality should be accepted, while 32% of Buddhists and 30% of Hindus say homosexuality should be discouraged by society. U.S. Asians’ views on abortion also are similar to those of the general public. About half of Asian Americans (54%) say abortion should be legal in all or most circumstances, while more than a third (37%) say it should be illegal in most or all cases. Among all adults in the U.S., 51% say abortion should be legal and 43% say it should be illegal. As is the case with the general public, Asian Americans’ views on this topic are closely linked to religious affiliation. Asian-American evangelical Protestants are especially likely to say abortion should be illegal in all or most cases (64%) rather than legal (28%). Similarly, two-thirds of white evangelical Protestants in the general public (66%) say abortion should be illegal in all or most cases, while 29% say it should be legal. Catholic Asian Americans are also more likely to say abortion should be illegal (56%) than legal (38%). By contrast, Catholics in the general public are closely divided on the issue, with 45% saying abortion should be illegal and 49% saying it should be legal in all or most circumstances. A majority of Asian Americans who are Buddhist and Hindu say abortion should be legal in all or most circumstances (59% among Buddhists and 64% among Hindus). Roughly three-quarters of U.S. Asians who are religiously unaffiliated say abortion should be legal in all or most cases (74%). About seven-in-ten of the unaffiliated in the general public (69%) also hold this position. For the most part, those who have worked to fix a community problem are more likely to have done so through a civic organization than exclusively through a religious organization. A fifth of Asian Americans (22%) report working to fix a community problem through a civic organization, 7% report doing so through a religious organization and more than one-in-ten say they have done both (13%). Evangelical Protestant Asian Americans show a different pattern; 20% have worked to fix a community problem only through a religious organization, which is twice as many as have worked only through a civic organization (10%). An additional 20% have worked through both kinds of organizations. The survey also asked whether Asian Americans—a largely immigrant group—think of themselves as “a typical American or very different from a typical American.” On balance, they are more likely to see themselves as very different (53%) than as typical (39%). Views on this question are strongly linked to whether or not an individual was born in the U.S. and the length of time an immigrant has been in the country. However, religious affiliation is also tied to Asian Americans’ self-perceptions of themselves as typical Americans or very different. Asian Americans who are Christian are more likely to see themselves as typical Americans than either Buddhists or Hindus, even when place of birth and length of time living in the U.S. are held constant. U.S. Asians who are mainline Protestant are more likely than those from other faiths to see themselves as typical Americans (48%) rather than as different (41%). Asian-American Catholics are divided on this question, with 46% calling themselves typical Americans and 49% seeing themselves as very different. The balance of opinion among other faith groups tilts to seeing themselves as very different rather than as typical. Indeed, nearly six-in-ten Asian-American Hindus, Buddhists and evangelical Protestants see themselves as very different rather than typical Americans. Native-born Asian Americans are more likely than the foreign born to say that religious freedom is better in the U.S. than in their country of origin. 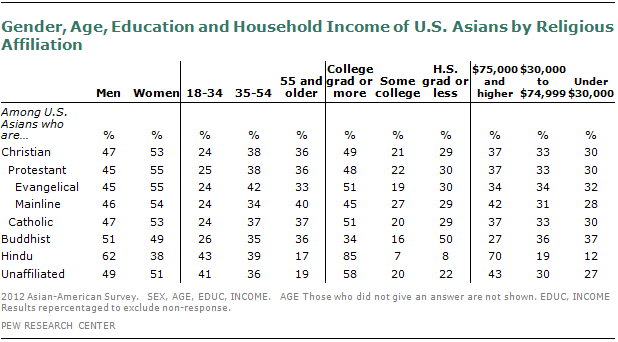 About six-in-ten U.S.-born Asian Americans (61%) hold this view, compared with about half of the foreign born (49%). Nearly nine-in-ten Vietnamese Americans who are either Buddhist (87%) or Catholic (88%) say that freedom to practice religion is better in the U.S. Similarly, Chinese Americans from each of the largest religious groups (the unaffiliated, Buddhists and Protestants) are as likely to say religious freedom is better in the U.S.
Asian Americans as a whole have higher education and income levels than the general public, although these averages mask significant variation among U.S. Asian subgroups. Asked how they rate their personal financial situation, fully 70% of Asian-American Hindus say it is excellent or good, the highest of all the major religious groups. This contrasts sharply with Asian-American Buddhists, among whom 36% rate their finances as excellent or good; 62% say they are only fair or poor. The other religious groups fall between Hindus and Buddhists on this measure of financial well-being, with 57% of unaffiliated Asian Americans 57% of mainline Protestants, 49% of Catholics and 42% of evangelical Protestants describing their finances as excellent or good.